In my country, we don't have high-speed bullet trains and I have no previous experience riding a bullet train either. I have a one week vacation in Beijing (both arrival and departure in Beijing PEK airport). What is the shortest city that there are bullet trains operating from Beijing? Trains to Shanghai take about 5 hours each way, so that is too much just to experience the train itself. Are there any cities that takes about 1-3 hours each way? Sorry if this question seems lack of research. I tried with some cities but I could not find any reliable sites to determine if the train is bullet train or not. *by bullet train, I meant those trains that go ~300 km/h. The trains you want are either "G trains" or "C trains". They are both rated at up to 350 kph but G designations are for longer distances and C for shorter routes. "Shorter" is relative. You can get 2 hours G train journeys. G – High-Speed Electric Multiple Units (EMU) Train This is the fastest running for long distance in China, the top speed of which could reach 350km/h. Currently, the G-train could finish the 1,068-kilometers Wuhan-Guangzhou High-Speed Railway in 3 hours, the 301-kilometers Shanghai-Nanjing High-Speed Railway in 73 minutes and the 458-kilometers Zhengzhou-Xian High-Speed Railway in 2 hours. BUT - the dfinitive guide to how to travel to anywhere from anywhere by train is "The man in seat 61" - be sure to find out where the name comes from :-). This Seat-61 page tells you just about all there is to know about Chinese train travel. High-speed 350 km/h C-category trains (sometimes known as Hexie trains) link Beijing South Station & Tianjin every 10-20 minutes, taking just 30 minutes for the 120 km (75 miles) journey. Simply use www.chinahighlights.com/china-trains to find specific train times. The fare is around RMB 58 (£6 or $9) for a 2nd class seat, RMB 69 (£7 or $10) in a first class seat. It's easy enough to buy tickets at the station on the day of travel. There will be other routes, but that seems to suit your requirement well. For the fastest of all journeys you could tale a G train to Shanghai and THEN take the "Maglev" train to the Pudong International airport. Under a 15 minute journey as I recall but daytime speeds of up to 430 kph (they say). The onboard speed gauge and actual train speed seem to not always quite match so actual speed may vary but you will find it very very very fast and noticeably faster than anything else. Cars on the adjacent motorway crawl along at 100 kph as you leap upon them from behind (figuratively anyway) and hurtle past in seconds. Marvellous !. I once got to travel the route 3 times in one day due to travel circumstances. Yee ha :-). Strangely, Seat-61 seems to not mention the Maglev - maybe it's not considered a train if it floats in the air with no wheels :-). Note that maximum speeds vary with time of day due to noise considerations. According to the Wikipedia page, full speed runs are only from 9-10:45 am and 3-3:45 pm. Check current arrangements when travelling. I tried using photos and vehicles on a motorway to estimate speed. If you estimate vehicles as travelling at maximum speed limit you can note the distances they travel per frame and/or per time and compare this to how long the train takes to cover the same distance. There is a significant amount of uncertainty due to parallax errors, different positions of view and deciding where the train is relative to the roadway in any given photo. It gave me results of "about 4 x car speed" which should be 'about correct'. My DSLR camera will take 12 frames per second when desired, which helps maximise material to take comparison photos from. I have used this method with reasonable (apparent) success in the past to estimate vehicle speeds on motorways either overtaking us at at high speed or approaching. For overtakers you simply estimate the time taken for you and them to reach a then distant point starting from the moment they pass you. For oncoming traffic similar but rearranged. Works to within error of estimation of distant location, timing and your mean speed. If you just want to experience going on the high speed train, then the trip form Beijing to Tianjin and back is idea for you. It takes just 30 minutes and Tianjin an interesting city to visit too. 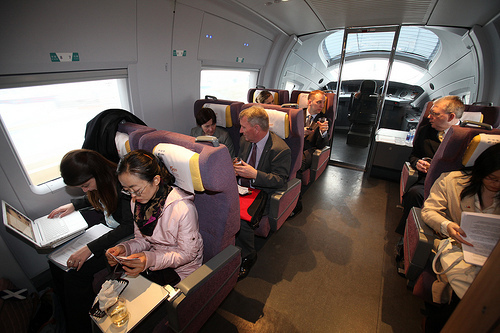 Uniquely, the trains of the Beijing-Tianjin route have an additional class - Premier Class - which is one level higher than first class. In premier class your are seated in the front compartment with just a glass partition between you are the driver. The centre chair in the above photo is the train driver's seat. You can watch him work while you enjoy the journey. Premier costs just 28 RMB or so more than first class so worth the upgrade. Not the answer you're looking for? Browse other questions tagged trains china beijing or ask your own question. Where in Beijing can I get a Yellow Fever vaccine and certificate?